A rewarding anthology spanning some four decades and more, from the Tenth and Eleventh Quartets of 1983 and 1990 (both written for the Kronos) all the way back to Sculthorpe's own reconstructions of individual movements from his first four quartets (teenage efforts, none of which have survived intact). The stunning Earth Cry (1986) sounds even more effective in its original orchestral guise (11/95), but there's no gainsaying the vibrant commitment and superior polish displayed by the Goldner Quartet. Truthful sound and balance. Peter Sculthorpe’s string quartets present a fascinating overview of the work of one of Australia’s most influential and innovative composers. 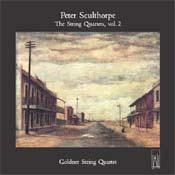 Believing European models inappropriate for Australian composers, Sculthorpe has approached composition from a unique perspective, creating a sound world that is powerfully evocative and distinctly Australian, even when divorced from extra-musical associations. Not that Sculthorpe would wish for this separation as is shown by his comments on the quartet Earth Cry. Here, the message is too important and integral to his underlying philosophy to be discarded: “A bogus national identity and its commercialisation have obscured the true breadth of our culture. Perhaps now we need to attune ourselves to this continent, to listen to the cry of the earth, as the Aborigines have done for thousands of years.” Earth Cry expresses both profound grief and rage at the destruction of the land and indigenous culture. Sculthorpe’s attraction to the Australian landscape in all its manifestations, from remote desert scenes to lush vistas alive with the sounds of birds and insects, led to a series of “Kakadu-inspired” works, of which Jabiru Dreaming is an example. Exploring the contrast of colonising and indigenous cultures, Quartet No. 10 portrays the duality in alternating blocks of sound. Both quartets demonstrate the composer’s mastery of textural variation and skill in sustaining non-developmental patterns particularly via the use of repetitive ritualistic rhythms. The selections of movements from Sculthorpe’s earliest quartets, dating from the 1940s, are interesting for the glimpse they provide into the early development of the composer. Showing a propensity for flexible scoring, Morning Son, Autumn Song and Saibai are arrangements from earlier works. Like Hills Songs 1 and 2, they induce a more sentimental mood, less weighed down by the convictions underpinning the more serious works. The outstanding Australian composer Peter Sculthorpe is at last beginning to receive the attention he deserves in Europe. Recordings are now available. And one of the best is the Golder Quartet’s superb account of String Quartets Nos 10 and 11, together with an astonishing transcription of his formidable compsition Earth Cry.